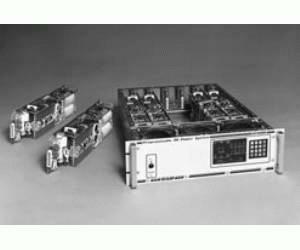 The Elgar AT 8000A/B programmable multi output DC power system accepts both power supply and electronic load modules simultaneously in a single high density 5-1/4" mainframe. Up to six fully independent channels of linear DC power and/or DC loads can be accommodated in one 19" wide rackmount chassis. The system can be expanded to 16 channels in master/ expansion chassis configurations. It can be controlled either locally from the front-panel keyboard or remotely via IEEE-488 GPIB using one selectable bus address. With the built-in test option, readback capability is available for voltage and current readings on DC power modules, Auxiliary Drive Modules (ADM'''''s) and electronic DC loads.